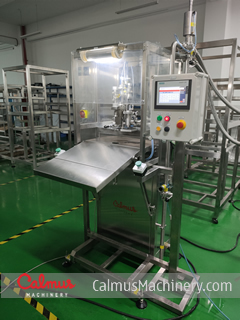 It is a Semi-automatic Bag-in-Box (BIB) Filling Machine and especially for filling spout-prepared bags with a wide range of liquids like drinking water, milk, syrup, edible oil and beverage. It requires a person feed bags onto the clamping head one by one and take them off when they are filled. Decapping, filling and capping are done automatically by the machine itself. 1) Grade 304 stainless steel body and 316L stainless steel fluid-contact parts. 2) Bags ranging in size from 3 to 25 litres can be used. 3) Perfect-design filling system ensures reliable filling. 4) Decapping, filling and capping all work automatically by control system. 5) New technology ensures no condensed water dripping onto bags. 6) A German electromagnetic flowmeter system employed improves filling precision and truly achieves the quantitative filling. 7) Designed with CIP (Clean-in-Place) function and circuit connection. 9) Reliable and in a high standard. Most components are German branded. 10) Easy to use. The touch-screen control system makes operation easy. 11) Options of vacuumization and nitrogen injection available for specific products use. A Fully-automatic Bag-in-Box Filling Machine is also available. Please click the link for details.